Wedding band Florence Italy – Hire a professional wedding band in Florence Italy!! Florence and its surroundings are one of the world’s most famous regions, and has become the dream wedding destination of many of the spouses, a very popular destination wedding getaway. We live near Florence (around one hour’s travelling time from) and we frequently play here; during the last years we’ve played in many wedding venues in and around Florence as (in alphabetical order): Casa Masi, Casale Celli, Castello del Trebbio, Castello Di Gabbiano, Castello Di Montegufoni, Castello Di Ristonchi, Castello Di Santa Maria Novella, Castello Di Vincigliata, Castello Il Palagio, Castello Vicchiomaggio, Fattoria Bacio, Fattoria Le Filigare, Fattoria Quercia Al Poggio, Il Castello, La Certaldina, Podere Patrignone, Poderi In Chianti, Tenuta Corbinaia, Terre di Baccio, Villa Atena, Villa Bianco Merlo, Villa Cora, Villa Di Maiano, Villa Fiesole, Villa il Granduca, Villa Il Poggiale, Villa La Ferdinanda Artimino, Villa La Massa, Villa La Palagina, Villa La Vedetta hotel, Villa Le Fontanelle, Villa Le Piazzole, Villa Le Rondini, Villa Mangiacane, Villa Pitiana, Villa Poggio Ai Merli, Villa Tuscany, Villa Viviani …and many others (see the Wedding band Florence Italy complete list of venues)!! Our Wedding band Florence Italy is the perfect backdrop for the most important moments of your life: church wedding, civil wedding, wedding reception, wedding cocktail hour, wedding party and so on; we have more than twenty years experience as professional musicians, and for more than ten years we have specialised in wedding music for foreign couples getting married in Italy. We work an average of 50/60 events per year. We have a high understanding of spoken and written English. You will be in safe hands and you’ll have the perfect wedding that you and your guests dreamed of. 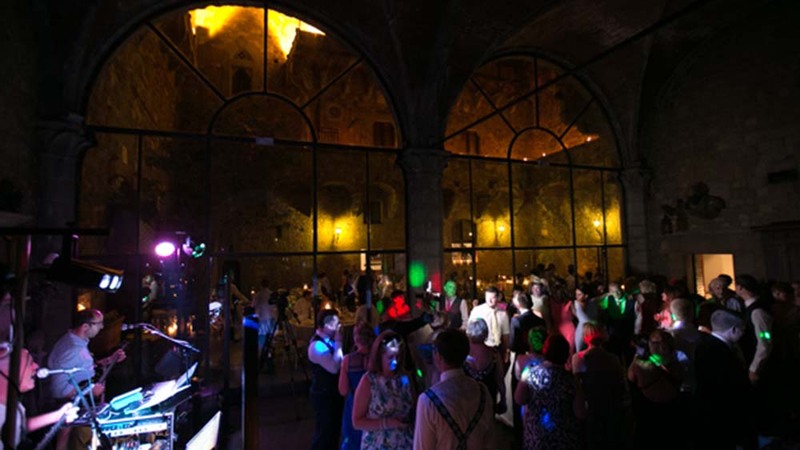 Our Florence Wedding Band work full-time on the musical elements for each event and are constantly in contact with the bride and groom as well as with the wedding planners in order to meet the clients’ every wish and need and to not leave anything to chance. Our Wedding band Florence Italy is not only a music band, it is a full sound design for events. Our packages meet your requirements from ceremony to aperitifs, from dinner to after dinner party!! 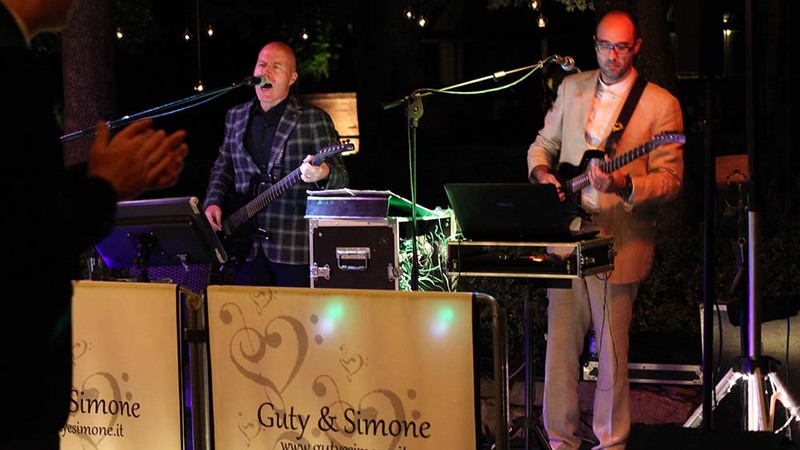 Guty & Simone the Florence Wedding Band have a vast repertoire which covers all musical genres from the 50’s to present day including: Italian and International Pop, 70’s-80’s Disco, Latin, Rhythm and Blues, Ratpack/Swing, Rock, Reggae, Country and Folk etc. in addition to live performance, we also offer a DJ service where we can mix requested songs in true DJ style. All requests from newlyweds or guests are granted instantly, including more modern genres such as R&B, Hip Hop, EDM as well as the latest chart hits. Our Wedding band Florence Italy can also accept DJ requests on-the-fly since we can access the web through our own Internet connection!!! In addition to the standard package our Wedding band Florence Italy can also organize the entire music entertainment for your wedding in tuscany. Go ahead and choose what you want!! – Ceremony music: Harp – Harp, Violin – Harp, Violin and Soprano voice – Keyboards, Soprano voice – Piano, Tenore and Soprano voice duo – String quartet – Classical guitar – Ceremony DJ and Audio microphone service etc..
– Wedding Video and Photo Service: a network of professional photographers and videographers with which we’ve worked over the last years. – Wedding band Florence Italy can provide also SIAE music tax for wedding info and payment ONLINE. Your wedding is our passion!! Our Wedding band Florence Italy will make your big day an unforgettable and unique moment!!! If you’re looking for something special for your Wedding we can help you! !